Philip Strange spoke to astrobiologist, science writer and broadcaster, Dr Lewis Dartnell. The world as we know it has ended! It doesn’t really matter what happened. What matters is that you and a small proportion of the world’s population survived. What would you do? How would you live? How much of our current technologically advanced civilisation would you try to re-establish? How much could you re-establish? The Apocalypse would expose a terrifying skills gap. This is where Lewis Dartnell’s recent best-selling book, The Knowledge (how to rebuild our world after an apocalypse) steps in. Dartnell imagines a post-apocalyptic world and the challenges facing survivors. He then provides enough practical knowledge of science and technology to help survivors re-establish a simple life style, and describes enough basic science to allow them to move on and relearn for themselves. For example, we read about how to grow food, generate power, prepare medicines, make basic chemicals and how to get metals out of rocks. 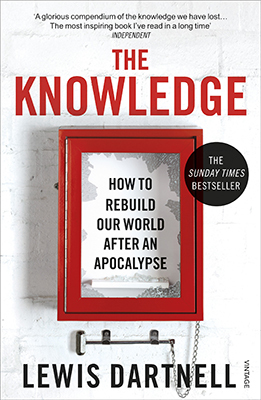 It’s a post-apocalyptic self-help guide but also an impressively wide ranging celebration of modern science and technology and how it underpins our lives. Dartnell writes engagingly and lucidly although with such broad coverage some may feel their favourite topic has been underplayed. Writing a book is a major undertaking so I asked him why he had chosen this particular subject. He told me that he had been driven “as a scientist, by curiosity, plain and simple”. He had wanted to find a way of describing the most important scientific discoveries through which civilisation had progressed to its current technologically advanced state. Surprisingly, he had based the book around the apocalypse only to provide a useful framework upon which to hang these ideas. Part of this inhospitable post-apocalyptic environment will be a breakdown of law and order; would society be able to move forward under such adverse conditions? “Some people will inevitably take advantage of the absence of control, the collapse of policing and it will become a bit wild.” But he went on to say that he had faith in the human spirit; humans would eventually work to help one another. A particularly novel aspect of the book is its linked website (the-knowledge.org) and I wondered how successful this had been? “I see the book as just the start of a discussion,” he explained, “the website has been very successful in getting that discussion going, allowing people to express their own ideas, and of course I have learnt so much from it”. The website also provides lots of additional material and background information about The Knowledge.